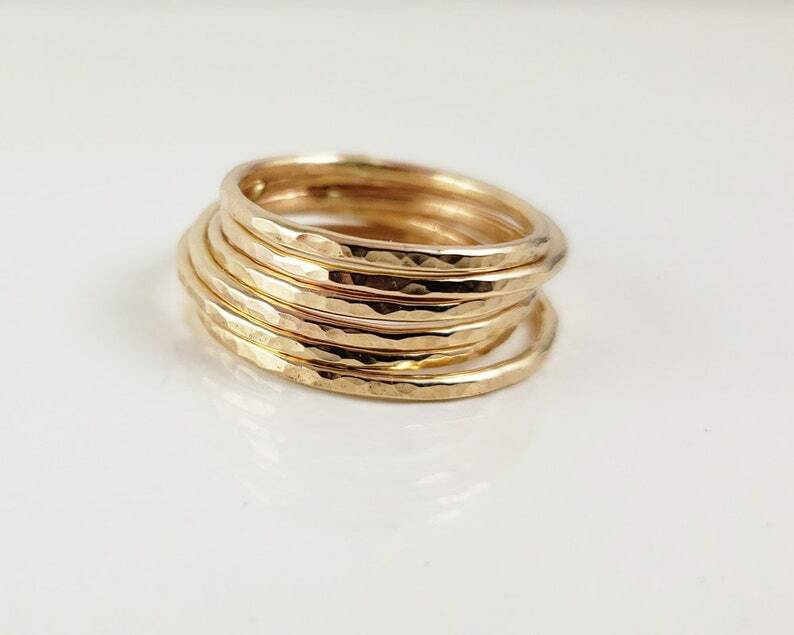 These 14k solid gold skinny stacking rings are beautiful in groups or even alone. They are skinny- measuring about 1.3mm. I hammer them for a beautiful light catching effect. They look best when worn in groups of odd numbers, 1, 3 5 etc. If you are going to order 5 or more to wear on one hand I do suggest getting them slightly larger than your normal size because together they will fit like a wide band ring. If you want more than one ring in the same size, please use the drop down menu to get the correct pricing. I also sell them made from rose gold filled, sterling silver and 14k gold filled. Please see additional listing in my shop for those metals. All stacking rings in a single order will come in the same gift box.